CHRISTMAS SUNDAY On Sunday, December 20th, at 10:00 AM we will have our traditional Christmas Sunday celebration, with the story of the Annunciation and Birth read by Bridget Peters, Storme Odell and Tony Brainerd. The readings will be interspersed with the beloved Christmas carols, God Rest You Merry, Gentlemen and Lo, How a Rose E’er Blooming and It Came Upon the Midnight Clear. Ted and Dotti Unkles will light the four Advent candles, Hope, Peace, Joy and Love, with the children’s help, reminding us that Christmas is not here yet, even though we already have begun the celebration. 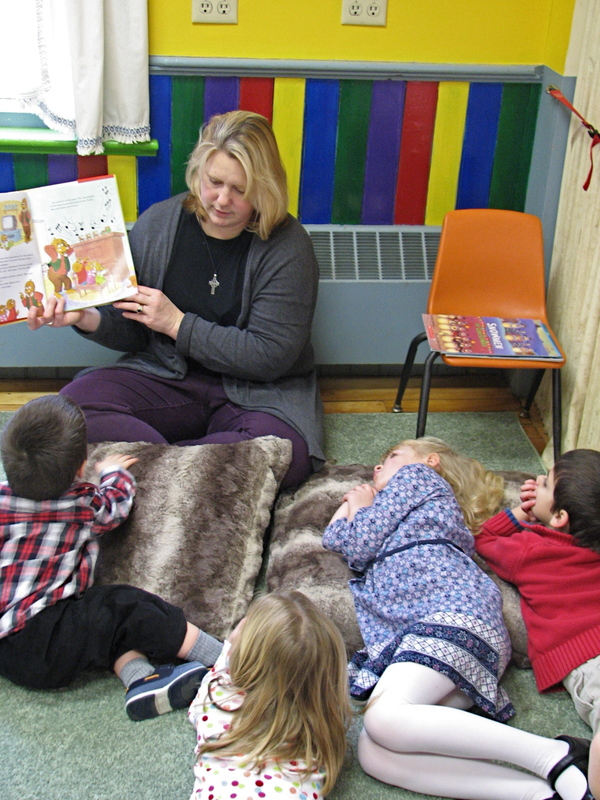 The children’s area just got more cozy! We have a new rug and some floor pillows for comfy lounging. The Missions and Social Action Committee of our church has attended a couple of informational sessions to see how the people of the Upper Valley can be of help. A group of several churches and synagogues is forming and researching ways to assists families in need. On January 31, the Missions and Social Action Committee will be providing the sermon for the morning centered on the topic of our response to this refugee crisis. Please feel free to talk to Holly Young, Lucia Button, or Tina Towle, or you can also contact Ginny Moore at 802-222-9675 or via e-mail (VirginiaMJMoore@gmail.com) if you would like more information or would like to help out. 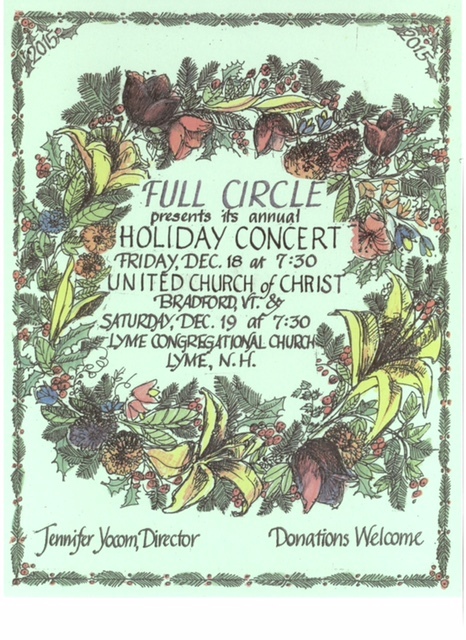 Full Circle presents its annual holiday concert at the church on Friday, December 18th at 7:30 p.m. They will give another performance on Saturday, December 19th at the Lyme Congregational Church. We are entering Advent this Sunday, which may be the most beautiful and beloved season of the church year. This is especially true if we include the Christmas Eve service, but each Sunday in Advent is full of music and rituals and readings designed to fill us with the Advent blessings of hope, peace, joy and love. Advent is a season to savor, and this First Sunday of Advent will offer many opportunities to feel moved. 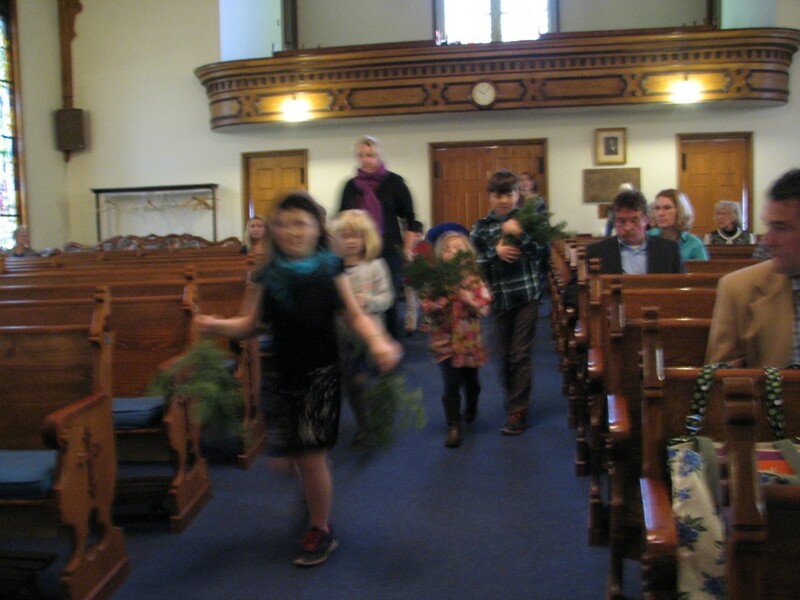 Early in the service the children will bring in greens to decorate the Advent candle table. The children and adult choir will sing Light One Candle as the Anthem, and then they will light the candle of Hope together.